Welcome Members! Thanks so much for subscribing to our Cloudeight Stationery Newsletter. We're pleased to present this beautiful screen saver. All the pictures included were taken by us in North Central Ohio during the month of November 2002. Cloudeight Screen Savers are very user configurable. You can turn sound on and off, change the transition effects, even show this screen saver in artistic black and white. If you'd like to learn more, please see our Screen Savers Help Page! Music for this screen saver was composed and is copyright by Don Gilman. We would like to thank Don for allowing us to use his compositions in this screen saver. Please visit Don's online studio by clicking here. If you like our site and the 2000+ free downloads we offer, please consider helping us by supporting our partners at Free CD Software and Unbeatable Deals. You can also get a free Cloudeight Screen Saver CD by contributing $10.00 or more to our Help Us Be Banner Free campaign. Your contributions have already allowed us to remove most 3rd party banners and popups from your member's pages. For details on how you can receive a free Cloudeight Super Screen Saver CD-ROM (we even pay the shipping!) please click here. 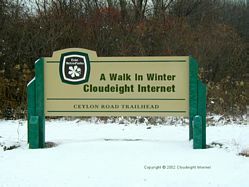 To download "A Walk In Winter" Screen Saver by Cloudeight please click here! All contents copyright �2002-2003 by Cloudeight Internet. All photographs in this screen saver are original Cloudeight Photographs and are copyright �2002-2003 by Cloudeight Internet. Musical compositions by Don Gilman (copyright by �Don Gilman ). Don Gilman's music is used with written permisson.